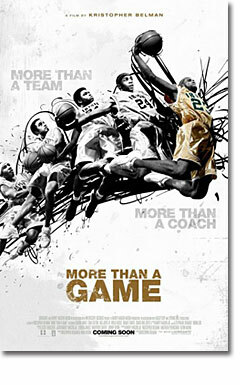 “More Than a Game,” Kristopher Belman’s documentary about five friends, including a hanger-on named LeBron James, who become high school basketball stars at St. Vincent-St. Mary in Akron, Ohio in the early 2000s, should appeal to fans not only of basketball and LeBron, and not only to coaches everywhere, but to anyone who has to create a Superman story. The dramatic problem with Superman has always been his invincibility. Who can possibly stop him? The dramatic problem halfway through this documentary, as St. V’s Fighting Irish regularly demolish teams by 40 or 50 points, is the same. Who can possibly stop them? This question is answered twice. The first answer is indicative of human nature. The second answer is indicative of a sadder, tawdrier aspect of American culture. They were the “Fab Four” of Akron basketball—LeBron, Sian Cotton, Willie McGee, and Dru James III—who first came to national attention in 1997 when, in junior high, they played at the AAU “Shooting Stars” Boys Basketball Tournament in Florida. “We were a team from Akron nobody’d ever heard of,” LeBron remembers. They wound up in the finals but lost, 68-66, to the previous year’s champs from southern California, when LeBron’s half-court shot at the buzzer bounced off the rim. He’s interviewed about it in the doc. He still looks pissed. By this time LeBron was already distinguishing himself from the others, and everyone assumed he would play for John R. Buchtel High School, a mostly black public school with a powerhouse basketball program, but he didn’t even decide; Dru did. Entering ninth grade, Dru was still under five feet tall and Buchtel’s basketball team wouldn’t have him so he wouldn’t have them, and his friends, loyal to a fault, followed him to St. Vincent, a mostly white, Catholic school, without much of a basketball program. With the help of Coach Keith Dambrot and assistant coach Dru James, Dru’s father, who had coached the boys in “Shooting Stars,” they gave it one. That’s what this doc is about, really: loyalty; teamwork. One may rise above, he may even get on the cover of Sports Illustrated as a high school junior, but he can’t win a team sport without a team. It’s also about disloyalty, or perceived disloyalty. After “the fab four”—or, with the addition of Romeo Travis, “the fab five”—won state titles in their freshman and sophomore years, going 23-1 and 27-0, respectively, Coach Dambrot, forgetting promises made to the boys, put his career and family first, and took a job with the University of Akron. “I never even talked to him again,” LeBron says. Coach Dru became their head coach. The doc, too, is no one-man show. It draws out the others. Willie is the quiet, mature one; Sian the funny, fat one. Romeo doesn’t really fit in at first. He’s selfish and angry and doesn’t put team first, but I like his admission that, “I never thought basketball would be my future. I just wanted to play because it’d get you girls.” My guy, no surprise, is Little Dru, all 4’ 11” freshman year, but determined to overcome what he couldn’t control, and sinking threes the way other guys sink layups. His dad was coach, and tougher on him for that reason—despite the fact that the dad only became coach for the son. Coach Dru was actually a football guy. He had to learn basketball. Halfway through the doc, St. V becomes a Division II school, and Coach Dru puts the boys on a national traveling schedule. Keep in mind: These are five guys from the same neighborhood competing against high school basketball powerhouses that draw talent from all over the nation. And they’re still routinely winning games 100-50. One reporter calls them the greatest team in high school history. The next year he does. Plus LeBron, who can’t stand losing, is now more determined than ever. Can you imagine? A team that routinely wins 100-50 is now more determined? The amazing thing, truly, given the media attention, the girls and the talent, isn’t that hubris stopped them once; it’s that it didn’t keep stopping them. It’s that they, and particularly LeBron, didn’t allow good fortune lead to bad. He kept a level head. The doc makes it clear that this happened, in part, because of his early bad fortune. He was born to a teenage mom. He never knew his dad. “We probably moved 12 times,” he says. “The hardest thing for me was meeting new friends, [and] I wanted to have some brothers I could be loyal to.” He found them. He kept his friends close and his enemies at bay. But enemies gather. We build to tear down in this country—buildings and people—and after the build-up of LeBron came the tear-down. Wait, why was this high school kid driving around an $80K Hummer? Turns out his mom bought it for him via bank loan based upon her son’s future earnings. That’s icky but legal. But wait! LeBron accepted two retro jerseys (Wes Unseld and Gale Sayers) for appearing on the wall of a sporting goods store? We can’t have that. And with only a handful of games left in the season, and the team climbing the national rankings—from 23 to 19 to 16 to 11 to 9—the Ohio High School Athletic Association stripped LeBron of his eligibility. That’s the second answer to what can stop them. File it under the smallness of people. At the same time the doc needed this dilemma to give its story drama. Every hero needs a villain, and sometimes the villains don’t show until the hero does. Wasn’t that what “The Dark Knight” was all about? St. Vincent did play one game without LeBron. They won, but barely, 63-62. Then LeBron went to court (the other kind) and the judge reinstated him. And that’s the last thing that stopped them. Comparisons will inevitably be made to “Hoop Dreams,” the 1994 documentary about two inner-city high school basketball players, William Gates and Arthur Agee, and how injuries and circumstances kept them from their dreams; but the two docs couldn’t be more different. Should I trot out Roger Kahn again? You may glory in a team triumphant (“More Than a Game”) but you fall in love with a team in defeat (“Hoop Dreams”). What stopped William Gates in “Hoop Dreams”—injuries—isn’t even whispered about in “More Than a Game.” It’s not an issue—any more than a knee injury would be an issue to Superman. We glory in LeBron but he’s from another planet. We also know how he ends (well), so we watch knowing the ultimate end, just as we watch Hollywood blockbusters knowing the ultimate end. “Hoop Dreams,” in comparison, is a small character study. Gates and Agee? We don’t even know if they live. But it’s fun and ends right. For 90 minutes we’ve watched these kids grow from not-bad “shooting stars” to incredibly talented, between-the-leg-dunking, on-the-verge-of-the-NBA superstars. But the last shot is Coach Dru with kids again. Sixth graders? Younger? They’re doing lay-up drills, and missing, and they’re small and clumsy and that basketball is so big in their hands. And it begins again.